During some food-styling downtime at a recent location shoot, Cathy concocted this elegant little tart. Of course, we thought it was beautiful, so we raced to put it on the set, and voilà! Do you love it?? Cathy started with a small, good quality shortbread cookie for the base. 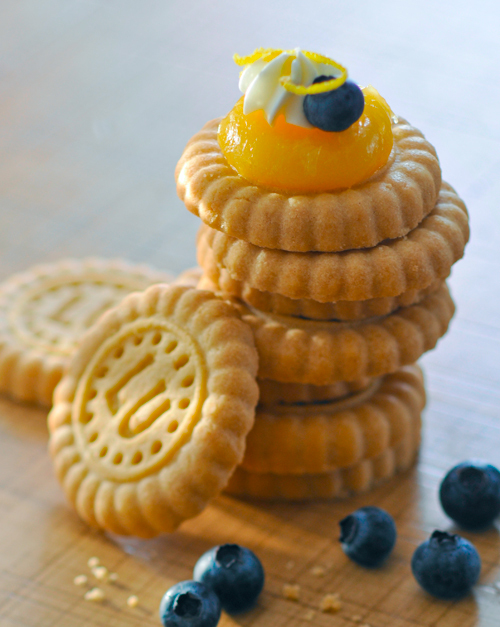 She used LU, a readily available shortbread cookie with an adorable crimped edge. She topped the cookie with a tablespoon of prepared lemon curd, then garnished with a tiny dollop of whipped cream, a blueberry, and some lemon zest. This is the perfect no-cook, no-bake recipe for those last-minute get-togethers when you’re short of time, but still looking for a dessert with some “wow” power. Just keep the ingredients on hand, and you can be turning out tarts at a moment’s notice. They are really really sweet. I am going to save this for one of my daughter’s lit club meetings. We are always looking for sweet dainty finger foods for her to bring. They are cute. Love this idea, thank you!! Great idea!! I love these….so quick and easy and yet so very pretty!!! Thanks Donna. Try some of the variations and you’ll be impressing your friends and family in no time!